Integrated Graphics vs. Dedicated Graphics: What’s the Difference? 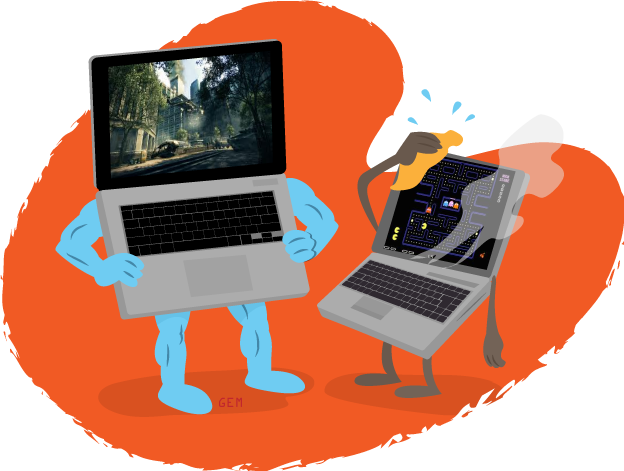 Whether you own a desktop PC or a laptop PC, the graphics hardware in your machine comes in two very distinct flavors. Integrated graphics hardware shares your PC’s memory with the rest of your PC. In other words, it has no RAM of its own. Dedicated graphics hardware has its own memory and can even have its own brain, called a GPU or graphics processing unit. What does this mean to you? A PC with integrated graphics is limited by the amount of memory your whole PC has. Sharing memory means that you’re going to be bogged down a lot of the time, especially when you’ve got a lot of graphics on the screen. Other than the memory, integrated graphics (identified by usually being from Intel) usually have inferior hardware to their dedicated cousins. Even when you’re not playing games, integrated graphics and Windows don’t like each other. The Windows Aero user interface really suffers. And watching a movie on your PC while doing something else at the same time? Forget it! A PC with dedicated graphics has its own memory, ranging from 512 megabytes on up to several gigabytes. In a desktop PC, dedicated graphics will be on its own card that plugs into the motherboard. On a laptop, it’s still part of the motherboard, but will have its own memory chips next to it. Dedicated graphics can still vary widely in quality, but in general, will outperform integrated graphics. Having its own RAM means your system is not fighting for memory with the graphics hardware. Dedicated graphics hardware with its own GPU means you’re not fighting your PC for CPU time, either. Some enthusiasts even have two dedicated graphics cards with a bridge between them for extra graphical power, and this method isn’t as expensive as you think. Anyone who wants to multitask a lot, or watch movies on your PC, or do anything that has to do with 3D graphics (such as games) is going to want a good graphics card for their desktop, or a laptop that has an nVidia or ATI sticker on it. These are the two main graphics manufacturers, and such a sticker tells you the laptop has dedicated graphics onboard and will perform well. Keep in mind that a graphics card upgrade can often require a new power supply. Check the label for minimum voltage requirements and check the top of your power supply when you first open up your case to see if your power supply is good enough. One last thought: If you’ve got a sluggish PC, a new graphics card may not be the answer. Try running through our Nine Steps and see if you can fix the issue without having to upgrade. Good luck!